This guide will walk you through using the ResetDRM.exe tool successfully on Windows 8. Out of the box it isn't officially supported, but after re-installing Windows 8.1 a few weeks ago I noticed my Zune / Xbox Music pass music wasn't playing - not the stuff already downloaded nor streaming. So I had to find a way to get it working. Zune was throwing a couple of different errors codes including C00D11CD and C00D2721. Windows Media Player was also effected, pretty good indication for whatever reason the DRM system on the machine was frazzled. My likely candidate was my RAM being overclocked by about 30% during installation, which did throw a few errors. Presumbily if you've found this walkthrough you've already got the ResetDRM tool, if not you can download it from the Microsoft website. A quick glance at the tool showed it to be a self-extracting cabinet file. I used WinRAR to have a look inside, but WinZip or similar tools would also open it up, this can be simply done by dragging it onto WinRAR. From here what we need to do is extract it somewhere, just dragging the files onto the desktop will do the trick. Next we need an elevated command prompt, which on Windows 8.1 is as simple as right-clicking the Start button and choosing Command Prompt (Admin). And then hit enter. That should successfully run the tool. A couple of weeks back I started the upgrade from Windows Home Server to Windows Server 2012 Essentials. I never bothered moving to Windows Home Server 2011, the lack of Drive Extender was the deal breaker for me. But with WHSv1 falling out of support, it had to be done, that plus all the drives were almost full, which was having a noticeable impact on performance sometimes, so time to do something about it. Plus getting something a bit more modern was much desired! For background I put together the current box from an Asus T3-P5G31 around 2008 or 2009, does the job nicely, small and compact. Only downside is there's only space for two 3.5 inch drives, I have a third in the 5 1/4 inch bay. I was running it with a 1TB, 1.5TB and 2TB drives. First up Windows Server 2012 Essentials isn't cheap, it is insanely expensive to use as a home server, at around ten times the price of WHSv1. But as someone who has run a server at home since Windows 2000, hosting commercially successful websites from it, along with Small Business Server 2003, just so I could get push e-mail to my phone, it was more a returning to the norm. But undoubtedly the price is a deal breaker, the product is clearly aimed at the small business. I ordered two Western Digital Red 3TB drives to go along with it. There was mixed opinion on the internet as to if the board with its ICH7 controller would support 3TB drives. So I ordered a Transcend PDC3 SATA board, to add 2 more SATA ports, and definite support for 3TB drives, if the on-board controller didn't. Also added 2 USB 3 ports, juicy bonus, or so I thought, more on that later. Before doing the install, I backed up all the data onto one of the 3TB drives by plugging it into another machine and copying everything over the network. Data safe, ready to go to work. I ended up installing the system on an old 500GB drive I had lying around, then using the two 3TB drives to mirror data on the server - I ran into a setback when Storage Spaces had to wipe the data from a drive to use it in a Storage Space - d'oh, so I had to copy the data to another drive, and then back again after creating the Storage Space - adding about 20 hours to the process. I then used the 2TB and 1.5TB drives together in a simple volume to hold File History backups, and also image-based backups. So yes, I have two drives sticking out of the case, but I needed the storage. Alternatively you could run with USB drives in nice tidy enclosures, but I don't need tidy. I had already tested it out in virtual machines so had few unexpected surprises. It installed without a hitch. Boom, joins the computer without messing with your local user profiles. It installs the Launchpad and Dashboard software, and away you go basically. I however ran into some issues. The largest of which was the server becoming unresponsive after about 12 hours, upon closer inspection it seemed the Transcend SATA card's USB driver had a memory leak! Luckily I'm not using the USB ports, so I disabled the driver. This is something you should be aware of if you're using this card in a similar setup. The following minor issue is the connector installation adds a service that periodically changes your DNS servers to your server, if you need to prevent this from happening you can disable the service (Windows Server LAN configuration). Lastly clients seemed to forget their network credentials every session, this would prevent File History from running unless you accessed the server and entered them again - it seems the Launchpad software changes the credentials from permanent to session only. Disabling the Launchpad software resolves this - there seem to be no major side effects - backups still run normally, but you lose server alerts, or trigger backups manually from the client (you can still do it via the Dashboard) - no big deal in my opinion. Presumably this is a side effect of running as a workgroup rather than a domain. All in all no major problems, just be aware it is way more expensive, and way more complicated to setup, well relative to Windows Home Server, certainly not compared to older versions of Windows Server. But alas it seems the Home Server market has been abandoned by Microsoft, however Windows 8 Pro does support Storage Spaces, so using Windows 8 on a home server isn't unreasonable, in fact it's very possible. And yes my Terraria and Freelancer servers continue to operate normally from it! 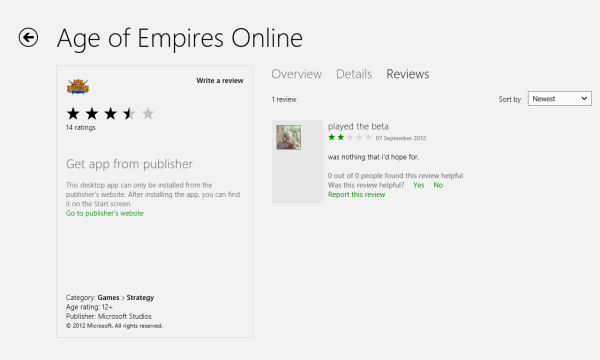 One of the key advantages to the Windows Store which many people overlook is the ability to showcase existing desktop software. 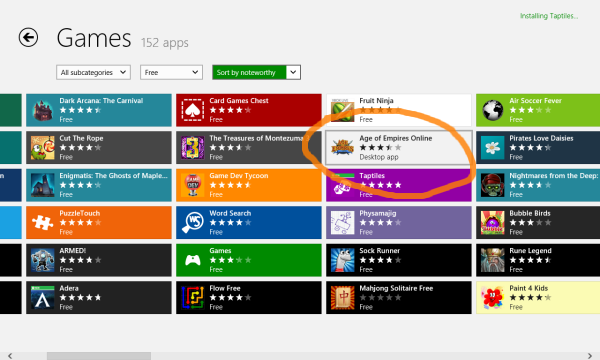 The Windows Store doesn't only deal with metro/RT/modern applications. It can show all the existing stuff, if their publishers use it. 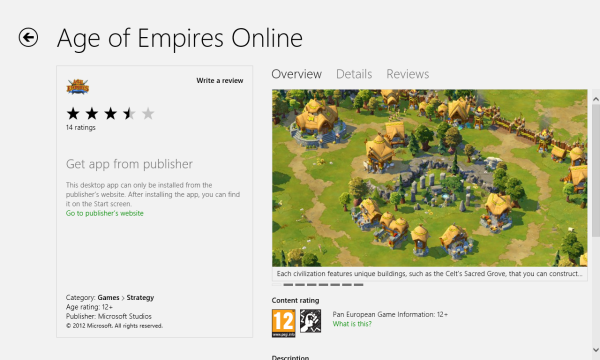 Here's Age of Empires Online listed. 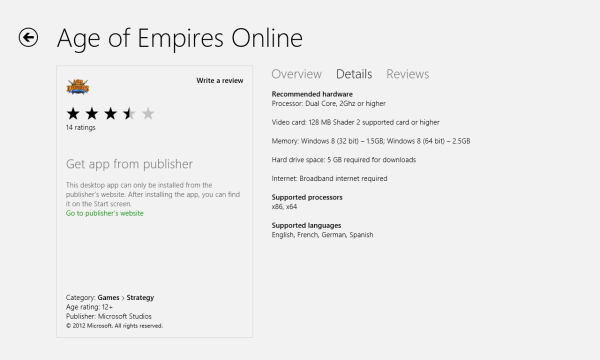 It also quite clearly is listed as desktop app. Hopefully to avoid any confusion. The experience is much the same as for a WinRT application. Except of course you get pushed over to the applications website to install it, or to buy it. A seemless experience might have been better, like Steam. One can only imagine how long-winded and un-friendly some publishers websites are. Maybe next time. As regular readers will know I'm a long-time Tablet PC user - my most recent purchase however was years back. That was an old Motion LE1700. One of the early ones, with a 1.2Ghz Core Solo processor. I've held off since, as low-resolution screens have dominated the market, and I don't see the point in upgrading to downgrade my screen. 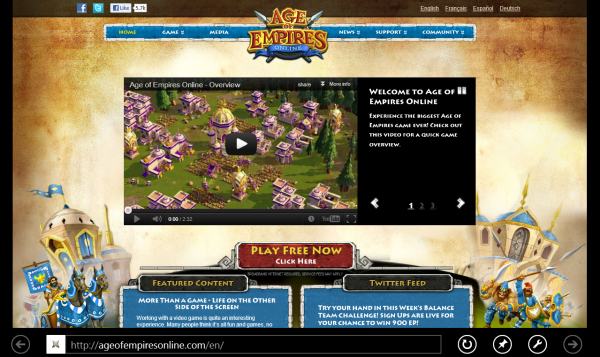 Launched early 2006 it originally shipped with Windows XP Tablet Edition. But I promptly upgraded it to Windows Vista. There were two major improvements it brought, first was the ability of the handwriting recognition engine to learn, the second was pen flicks - probably the single most important innovation for making Tablet PC use faster and easier. Instead of grabbing the scroll bar, or using the D-pad - which isn't always under your thumb or fingers you could just flick a page up and down, and it would scroll, flicking left and right would move forward and backwards. This worked across Explorer, Internet Explorer heck pretty much everything. You could even set it to use diagonal flicks to do things like copy, paste, delete etc. Windows 7 brought some performance improvements, but it was clear the Windows and IE teams were no longer interested in focusing on these active-digitiser based tablets, despite me hassling the IE team for years, pen flicks were never fixed in Internet Explorer, they've been broken in three major versions now. Other browsers never properly supported the input panel, and/or pen flicks so were difficult to use compared to Windows Vista and IE7. Windows 8 continues that tradition - and makes it worse in some regards. You no longer get a hovering input panel when the pen is focused on a field to enter text, you need to manually open the keyboard. Like Windows XP pre-SP2. Nasty. However in the new modern environment you always have a keyboard open up. Sweet. Now if only that worked on the desktop. Other than the tablet features of Windows retreating - making using Windows 8 on the desktop in many ways like the original Tablet Edition of Windows. Windows 8 actually runs quite well. The new modern-environment largely works OK, bar having to use the scroll bars to scroll around rather than flicking - there's a few performance issues with some of the games but it is quite useable. More so than Windows 7 was in my opinion. There's a few other issues with Windows 8 - Internet Explorer renders text in a sort of half-assed approach, rather than proper ClearType. I don't think it is using sub-pixel positioning, in the desktop or modern environments. This makes some fonts, especially ones designed for ClearType like Segoe look pretty bad. You might argue that's less important since screens are finally starting to increase in DPI - but tell that to my desktop screens - that aren't, and have maxed out the resolution of DVI/HDMI. The earlier issues I've mentioned like a pegged-CPU in the earlier builds are now fixed - at least after connecting to Windows Update. But I'm still at two minds what to do. The plan is to buy an ARM based Surface when they're available in October, as a stop-gap as they're pretty low-resolution and don't have an active-digitiser. Then an x86-64 one when they're available 3 months later. The x86-64 ones have 1920x1080 screens, so will do my fine on the resolution front and they have a pen for the times when I don't want to get the screen grubby. Do I wanna go back to Windows Vista on the LE1700? Undoubtedly the best old-school Tablet PC OS? Or buy Windows 8 since it'll be dirt cheap and leave that on there. Technet or MSDN and installing Windows 8? Just a quick heads-up for those subscribers of TechNet or MSDN who are looking at installing Windows 8. Windows 8 automatically activates when connected to the internet, and it seems to do it almost straight away. Don't wanna waste those now-limited keys activating virtual machines or other temp boxes that you're only going to use for a week. I suggest pulling the plug on internet access unless you need it/can work out how to block it from activating. Alternatively there is a 90-day trial version of the Enterprise edition available. Might be best to use that for evaluation - be warned the trial cannot be later upgraded to a final version. Seems the old advice of not activating machines you won't be using for very long isn't very valid anymore. Need the Windows Vista days back, of installing without even having to faff about finding a product key - don't have to worry about accidentally activating that. An article written by Johanna Armstrong on Piki Geek has taken the crown as the most inaccurate Windows 8 article I've seen to date. I won't be linking to it, you can find it easily enough by searching for it, but I refuse to assist their search rankings. The PC Master Race is facing a threat from Microsoft, a threat that both Valve's Gabe Newell and Blizzard’s Rob Pardo have spoken out against. The threat is Windows 8. Nice way to start an article. As someone who a lot of people would regard as being part of the "PC Master Race", I like Windows 8. Newell explained that he was trying to make Steam and Valve's games compatible with Linux, as a way to make alternatives in case Windows 8 becomes a reality. Windows 8 is reality. RTM is imminent. Valve releasing Steam for Linux is a low-cost option for cornering another market. Porting the Source engine - almost 10 years old, no big deal. The article then goes on to quote Michael Mace, former executive at Apple and Palm. An impartial source? Not likely, especially since Windows Mobile buried Palm, and Windows buried the Macintosh. Windows 8 is still Windows NT. It certainly doesn't use an emulator to run Windows 7 applications, they run natively just like they've done in the past, such a suggestion is absurd. Johanna goes on to say "Windows 8 uses an interface known as 'Metro', which turns everything into an app." errr, what does that even mean? Everything a computer runs is an application or program of some sort and always has been. Windows 8 has metro-style applications in addition to traditional ones, and it has a metro-styled Start Screen, which replaces the Start Menu. Turns everything into an app? What do you think Steam, Office, Civ 4 are anyway? They're apps. This means that programs like Steam won't be able to run on Windows 8 without turning itself into a Metro-friendly application. Furthermore, all of the applications will be full-screen, although you can adjust them to 1/3rd or 2/3rd of the screen, which isn't really an improvement—forget about moving a window out of the way to view another, and forget about the Start button: there isn't one, not even on the desktop. And for those of you with battle stations: Windows 8 doesn't currently support multi-monitors, so forget about playing a game on one screen while browsing online on the other. One screen has to be devoted to Metro at all times. 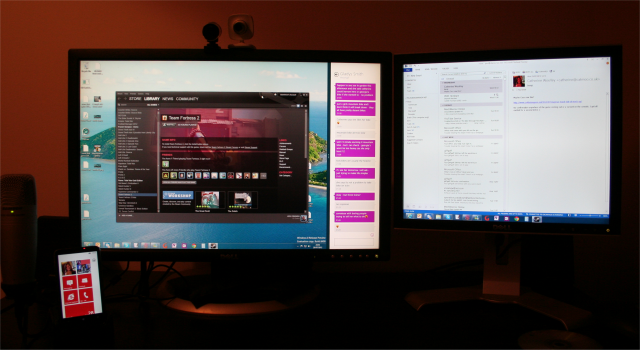 The above screenshot shows Windows 8, running on multiple monitors with the Metro-style Messenging application open down the right-side of the left monitor, Outlook 2013 open on the right monitor, and Steam running on the left monitor, a window, not fullscreen. I could also cover it up with other applications if I so choose, just like always. Sorry, what were you saying about not supporting multiple monitors? What were you saying about Steam having to be metro? All false, do some research. Really? Works fine here on all my PCs. Plus I get all the new power-user features that Windows 8 sports, like 2-click opening of Device Manager, admin-elevated Command Prompt, loads of other admin-style tools, much faster performance (great for games), overhauled File Explorer which can pause file transfers (sweet). Better battery life, much faster boot, better multi-monitor support, I can even have the Task Bar on both screens now, and set it to show all open apps, or just the ones on the specific screen its on (nice). I use the desktop, just like I always have and move into metro when there's a metro-application I want to use. I don't even know where to start with the comparison to a mentally disabled iPad.